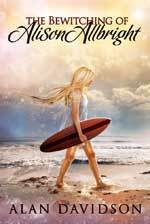 Alison Albright is a girl who dreams of a better life. When the mysterious Mrs. Considine makes those dreams a reality, they come at a price. Will Alison live her dream and live with the consequences? The Bewitching of Alison Allbright is a re-release of Alan Davidson’s 1987 novel of the same title. Alison is quiet, shy and not living in her imagine ideal circumstances when she has the chance to live in the place of wealthy Mrs. Considine’s deceased daughter. Alison serves a purpose to middle grade readers that the grass isn’t always greener. and sometimes you have to make the best of the life you’re living and to recognize its happiness. I think most people of a certain age can identify with Alison, in wishing as childrenk we could change something about our circumstances. The character of Alison as Davidson writes her is real and relatable. Allison is in no way the perfect child. She’s shallow and self-centered and believes life owes her a certain standard. While the character was annoying to this adult at first, she certainly grew on me. The characters of Alison’s home life are a little thinly written, but with the true focus Alison and Mrs. Considine, young readers will not miss the development. The story is fluid and despite a bit of a slow start, moves quickly for the reader. Davidson keeps the story direct making it appropriate for young children, but provides twists that give this modern children’s classic an abiding appeal. Even the youngest children will be suspicious of Mrs. Considine and her true purpose with Alison. A bigger question for children will be the fate of Considine’s daughter, Camilla. While Mrs. Considine’s motivations are a mystery, she serves a purpose as an eerie woman of questionable ambition. Is anything she tells Alison true and does Alison care as long as she has the advantages that Mrs. Considine’s money provides? In the 80s, a time of consumerism, the story would have been timely for children and perhaps even more so now. Kids at school may have more things, friends or a calmer home life, but that doesn’t make them happier. Davidson’s plotline carries children through the adventures reminding them frequently of the message and while things may seem better at first, no situation is perfect and some are potentially dangerous! Alan Davidson is from Scotland and worked as a a Civil Servant until he started writing in 1978. Many of his books have been re-released by Straw Hat Publications. Read a further review A Friend Like Annabel (Short Story Collection). You can connect with Alan Davidson on Goodreads. Read an interview with him on Bookish Whimsy: Click here.